Wigan Athletic dropped a place in the Championship table - but moved a point further clear of the drop-zone - after a goalless draw against Brentford at the DW. Paul Cook’s men edged a relatively uneventful encounter, but couldn’t quite manage to find the goal that would have ensured all three points. Reece James saw an incredible 35-yard effort tipped over the bar in the first half, with Chey Dunkley also forcing a great save from Luke Daniels in the second period. Daniels also denied Gavin Massey at the beginning of the second half, after a sublime contribution from Nick Powell following a lung-busting run. And Anthony Pilkington saw a ‘goal’ chalked off when Joe Garner was flagged offside in the lead-up. When Dunkley’s header in the final quarter looped over Daniels but crashed against the woodwork, Latics knew it wasn’t to be their day. At the other end, the Bees remained a threat on the counter. But Christian Walton only had one real save to make, with those in front of him forming an effective barrier. Brentford had looked arguably the most impressive opposition side against Latics this term, when winning the corresponding fixture 2-0 back in September. And the scorer of both goals that afternoon, Neal Maupay, was quickly into the action, pulling a shot just wide when given far too much time and space just outside the box. There were open mouths when Latics mounted their first attack, with on-loan Chelsea starlet James almost pulling off the goal of this and any other season. From a Brentford point of view, there seemed little danger when a cross from Nathan Byrne saw Michael Jacobs nod the ball to James, 35 yards from goal. With no backlift whatever, the Latics youngster cut across the ball with incredible technique, and the whole stadium watched as Daniels furiously backpedaled before tipping the ball over the top in the nick of time. Latics lost Jacobs to injury just before the break, with fit-again Pilkington taking his place in the forward line. But the home side overcame the loss to threaten first after the restart. Powell did all the donkey work by winning possession and then driving forward before picking the perfect moment to supply Massey. The forward’s control was decent, but his finish wasn’t clinical enough and allowed Daniels to make a vital save. 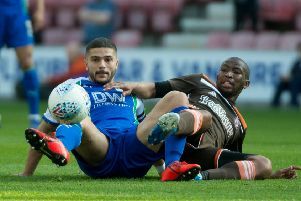 Latics were given a warning when a Brentford free-kick was flicked on and deflected just wide of Walton’s post by an unsuspecting attacker. 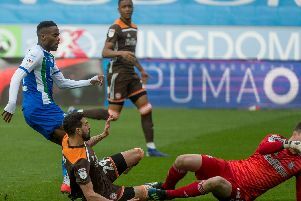 Walton was then alert enough to keep out a strike from Said Benrahma, with Kamohelo Moketjo also firing just wide from distance as the Bees enjoyed their best spell. Latics managed to stem the bleeding and got back on the front foot, with Dunkley’s header from a James corner forcing a very good save from Daniels at the expense of a corner. The home side thought they’d broken the deadlock with 13 minutes remaining, only for Pilkington’s finish - off Garner’s clever knock-back - to be chalked off for offside. And there was further frustration in the dying moments when Danny Fox’s teasing cross was headed over Daniels by Dunkley - only for the ball to rebound off the stanchion.